M5 has developed a new carbon 26 inch monofork for the M5 High Racer and a new (narrow) 20 inch double front fork for the Low Racer! A new 26 inch mono front fork, full carbon. Suitable for both ETRTO 559 as 571, with carbon headtube, wing profile and a 15 mm axle attachment. An ultralight (275 grammes) double carbon front fork for 20 inch (ETRTO 451). With a width of just 55 mm. So with this front fork the chain can pass freely! New 12 K carbon finish for our head rests! 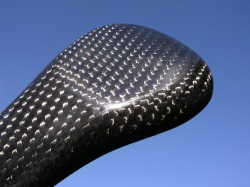 Our light weight carbon headrests are now coated by a 12K carbon finish. www.nu.nl says that there are now one hundred million internetsites worldwide. When we tested the popularity of the M5 internetsite on sitescore.silktide.com we found that M5 is among the one percent most populair internetsites in the world! It's a good score, considering only the domains which have actually content are in the list of the one hunderd million. So thanks to all who are following the developments at M5 Recumbents via our internetsite! Finally ready after eight months intensive designing, drawing, calculating, cutting and so on: the M5 super light crankset of 238 grammes!! And like our brakes: not only light, but also very stiff. And we established another record: this aluminum crankset is by far the lightest in the world! It's 20% lighter than the current record holder, the THM Clavicula. But it's getting even better: this M5 crankset is also 10% stiffer than the mentioned crankset. Everything is tested according to the protocol as used in the German magazine "Tour" nr. 7 , july 2006, pages 30 till 33. The product is fully manufactured from aluminum 7075-T6 with a hard anodised coating. The current testing copies are based om a 175 mm crank with a BCD of 110 mm. The corresponding axle with cups and bearings is 120 grammes or 140 grammes (heavy duty). Also alu 7075-T6 and hard anodised. 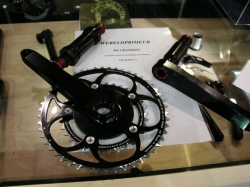 Probable date of delivery of the in larger quantities made crankset is january 2007. 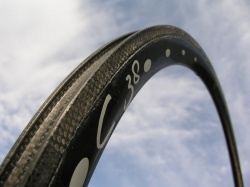 After many months of testing we present our M5 Full Carbon clincher and tubular rims. Available in 38 or 50 mm height. Width is 20 mm. Both are guaranteed for a tyre pressure up to 9.5 bar. If you couldn't come to Bike Motion here the first "espionage pictures" of three absolute world scoops: our crankset, hub and rims. M5 has a stand on the Bike Motion event and will present its newest recumbent models and several light weight components. Worth the effort to have a look in our stand! The M5 Carbon High Racer can also be equipped with a large luggage compartment. The carbon tailbag offers 65 litres space and also optimizes the aerodynamics of the bike even further. The weigth of the tailbag is just 2 kilogrammes. A complete High Racer including the Tailbag is just 11 kilogrammes! The luggage compartment can be locked with a key. 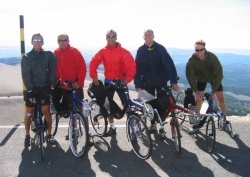 Maarten Broek sent us several pictures of the ascent of the Mont Ventoux with 5 M5 Recumbents. Beautiful windy trip. Heavy mistral and cold during the day of ascending. We managed to convince a lot of people of the comfort of the bikes. Also the bike rental at the bottom of the mountain. Also showed the M5 site. We did our annual promotion work once again! Helmut Lechner (Austria) covers a strong race during the World Championships HPV 2006 in France. After a fast start, passing a railway crossing with 90 km/h, Helmut unfortunately breaks a spoke in the front wheel, resulting in a dragging brake shoe. This surely explains the three seconds behind the number one! Despite the misfortune with the spoke, Helmut races with an average of 60 km/h to the finish in just 9 minutes en 40 seconds.